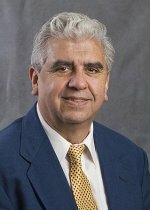 Dr. César Izaurralde, a Pacific Northwest National Laboratory scientist and expert in atmospheric and hydrospheric sciences, was recently named fellow of the American Association for the Advancement of Science for his exceptional efforts to advance science and apply it to real-world problems. The AAAS is an international non-profit organization dedicated to advancing science around the world. The association will honor its new fellows at its annual meeting in Washington, D.C., in February 2011. A soil scientist with more than 30 years of research experience in agronomy and ecosystem modeling, his research is critical to how soil, water, and plants are affected by human actions and climate change. He has helped develop and improve computer models that examine climate change in agricultural systems and biogeochemical cycles in soil. Izaurralde has also contributed to several climate change assessments and is often asked to provide scientific information regarding climate change to policymakers. His research has advanced scientists’ understanding of soil carbon sequestration as a tool to mitigate climate change and sustainability issues associated with biofuels production. Izaurralde is a PNNL laboratory fellow at the Joint Global Change Research Institute, a collaboration between PNNL and the University of Maryland. He is also a fellow of the Soil Science Society of America and the American Society of Agronomy and an adjunct professor in the Department of Geography at the University of Maryland.